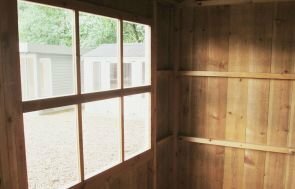 This National Trust Blickling Garden Shed is a traditionally styled shed with the addition of an open logstore on one end, and it has been installed in our customer’s large, country garden in Maidstone, Kent. 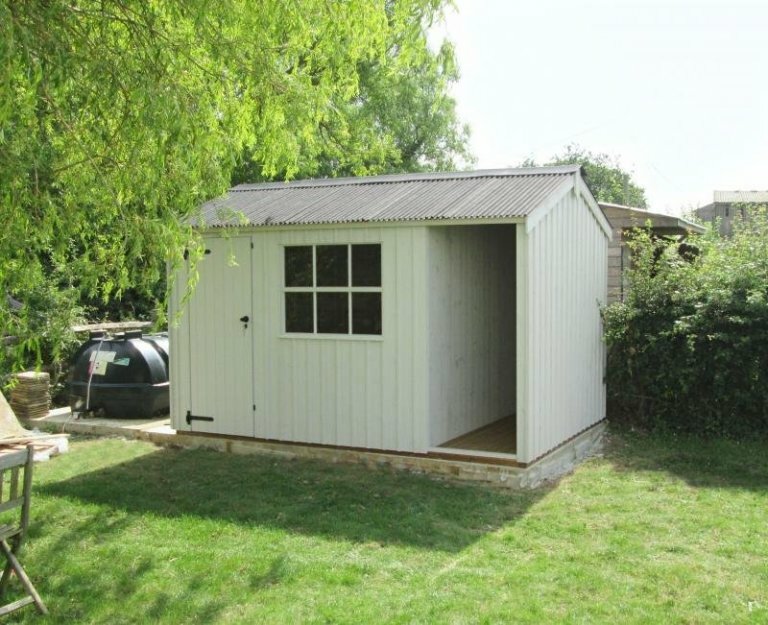 The National Trust range of sheds and summerhouses are made in set sizes and set designs to adhere to the National Trust’s established specifications, and this is the largest size Blickling we make at 2.4 x 3.6m. 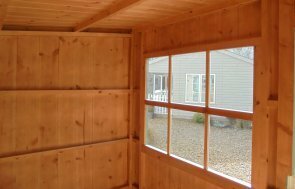 The logstore is 0.9m wide, giving an almost square area of space for the shed section of the building, and allowing a good amount of storage space for the customer. Since the designs of the National Trust range are based upon old outbuildings of National Trust properties, they are very traditional in style, with corrugated sheeting on the roof, Georgian windows, cast iron door furniture, and vertical sawn boards for the external cladding. The paint colour used on this Blickling is Earls Grey, which is a pale, neutral colour from our National Trust paint range. This is a range of paint that we’ve put together with six, natural paint colours in to use specifically on the National Trust range of garden buildings. For more information on the National Trust Garden Sheds and Summerhouses, you can call us on 01760 444229 or create your own garden building by using our Online Garden Building Planner Tool.